June 6th in Social Media, Wordpress Plugins by Wordpress Jedi . There are plenty of social media plugins that allow your visitors to share your posts with their friends. But have you ever wanted to let people share parts of your posts with others? Highlight & Share for WordPress offers that functionality. It lets your visitors select and share text via Twitter. They can also share your entire posts with their Facebook friends. 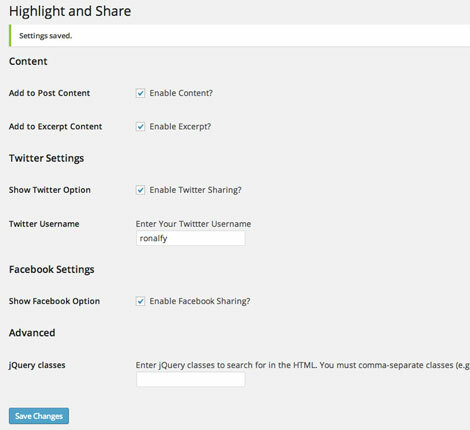 The Highlight & Share plugin lets you enable and disable Twitter and Facebook sharing. You can also add your Twitter handle in the backend. Once people highlight a part of your post, they will be able to share it with their friends. Webmasters can override which content is selectable. Highlight & Share may not work perfectly for every site, especially those who have short pieces, but it could potentially help more people discover your excellent content. You can try it for free.